Used for treatment of shoulder dislocation, bursitis and for temporary immobilization of arm and shoulder. 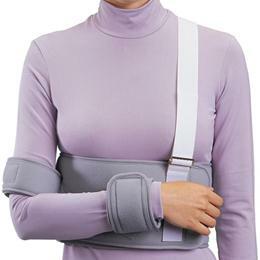 Wraparound chest band with shoulder strap provides maximum support and protection. The elastic wrist and humeral cuffs are sewm to the chest band and are adjustable by hook and loop closures.